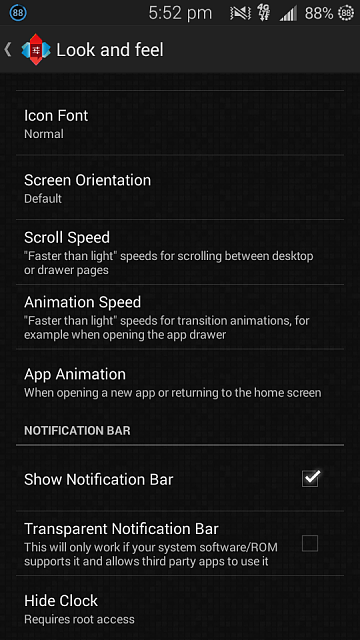 The status bar being hidden may be in Settings>Display, or in the launcher settings. Settings>Launcher. You can try downloading a launcher, like Nova. That may force the status bar back. I'm sure this has been resolved, but for anyone else that may have a problem check to make sure you didn't accidentally hit the Expanded Desktop Button which when activated will hide the status bar. Press the Power button to open the power menu to find the option. This was exactly my problem! I had no idea what else it could have been, thank you so much!! when I open the power menu and slide the circle to unlock, the status bar is disappearing again. It only shows in the power menu so I can switch between open apps, but that's about it. My status/ task bar is missing since update, Can you tell me how to get it back ,step by step please. This is not an option found here for me? My status bar went missing too. I found that an update turned the font white in the home screen mode (and the background was white where the status bar was) I edited my background picture and that was it. Some apps change the font black automatically but the home screen is white. Hope this might help someone. It is possible it has something to due with system resource utilization. (I use a 5 year old device with 4.2.2) For instance, my status bar will sometimes despair and then come back in a few seconds. I have never had it crash and not come back. « Who still runs Gingerbread?